Gone are the days when schools and universities were required to buy, build and maintain their IT infrastructure to use any software. Now, Software as a Service (SaaS) has become a standard model for the best construction management software for many education project manager applications, which nullifies the high cost of implementation and maintenance of the software. With SaaS, there is no need to worry about downtime, backups, storage or maintaining the software upgrades and updates. SaaS is also no longer a new concept in construction industry. Cloud-based construction management software helps project owners for school districts and universities to efficiently manage their construction processes without worrying about IT set-up and maintenance. It also gives them access to project information from anywhere and anytime through a web browser. The upfront cost of cloud-based software is meager compared to traditional on-premise software. You are relieved from purchasing costly servers and storing them in even more expensive data centers. There is no need to hire IT personnel to keep them up and running. Did you know that the "Cloud" can reduce costs by as much as five times what it would have cost a company to host the same resources? This is a dominant driving force behind the adoption of cloud computing. SaaS also gives hardware independence. You are not restricted to any particular computing hardware, tablet or smartphone. All you need is access to the internet with any of these devices. SaaS providers are responsible for maintaining the software, managing the updates and upgrades as well as for keeping the hardware up and running. This makes deployment of web-based construction management software wholly worry-free and comfortable for the project owners. At Projectmates, all updates and upgrades occur automatically and seamlessly with no action required on your part or your school. The cloud-based software enables data access from anywhere, anytime with an internet connection. Projectmates further simplifies this as the software uses your devices' native browser (Safari, Chrome, IE10+, and Firefox) for easy access ANYWHERE, anytime on ANY device. No exceptions! You have access to all sorts of project data: bids, proposals, drawings, photos, project status, etc. whenever and wherever you need that. This includes mobile access with a completely native app to utilize your phone and tablet features, including push notifications. The construction team works in the dispersed environment, and hence a powerful collaboration tool is essential to allow them to work closely. The cloud-based construction management software provides a real-time communication and collaboration platform. Users in multiple locations can get access to latest information and can review and edit the data as and when required. Shouldn't your team be able to communicate in real time with one another regardless of distance or preferred mobile device? All the project data is stored in one centralized place. It ensures that no information gets locked in an individual's computer, hence a single source of truth. There is no need to track the whereabouts of any piece of information to start working on data. All changes are made in real-time and accessible to the authorized person. This improves efficiency and reduces the need to exchange multiple emails, search various folders, or get limited to office boundary to access the required info. Projectmates offers one place for everyone to collaborate and one version of the truth. 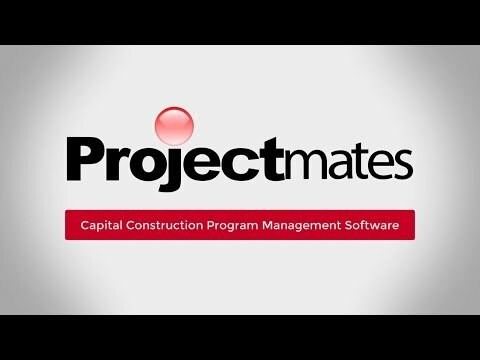 The industry-leading, web-based capital construction management software like Projectmates streamlines communication among project participants. Team collaboration is improved, and decision making becomes more comfortable with improved transparency in the management processes. Information flow becomes effective as data exchange becomes easier, and everyone works on the same piece of information. SaaS offering the benefit of scalability means that you can increase or decrease the number of users based on your project requirements. You do not have to buy another server or software to accommodate your new business needs. You only pay for what you use. Being cloud-based software, Projectmates provides the flexibility to add projects and users as you grow. Unlike the traditional model, it is a matter of just a few weeks to get up and running with a SaaS solution. The user does not have to spend time in installation, configuration, and deployment of software. This results in reduced cost and time saving for the project owners. Implementation with Projectmates is a matter of weeks opposed to months or years. With SaaS solution, everyone's 'to-do' lists, requests, approvals, and completed tasks are updated, maintained, and easily retrieved — eliminating significant amounts of risk. Another most significant advantage is that if a disaster strikes your business premises, you can get access to your data and get back up and running quickly from another location. To put it simply, a web-based software offers greater collaboration, increased accountability, decreased risk, and more significant interactive functionality than the traditional model of in-house software. Cloud-based construction project management software like Projectmates not only reduces the cost of ownership, but also allows enhanced project controls, improved visibility, and standardized operational processes. This streamlines communication among the internal and external project participants, enforces accountability, and aids in better decision making. All this translates into better ROI and significant savings of time and cost. With its cutting-edge technology, Projectmates creates one seamless platform for managing the complete lifecycle of construction from planning, bidding, and building to maintaining the facilities. Over 100,000 projects from organizations such as yours in the Educational field rely on Projectmates to manage billions of dollars in capital construction programs. Projectmates has been trusted by construction owners for over 20 years and is SOC 2 TYPE II certified. The software comes in many shapes, sizes, and promised usability. The best construction project management software will offer a multitude of features and modules. Smart Cities are beginning to develop all over the world, and with that, revolutionary technology has risen with the power to completely change our way of life.